A gallery wrap is a printed image, usually canvas, that is stretched and mounted to a frame with the image wrapped around the edges. It can be displayed without a picture frame and lends itself beautifully to photography as well as traditional artwork. Traditional stretching to create a canvas gallery wrap requires tools, skill and a degree of patience to get a professional finish, not to mention the time to do so. Outsourcing this task to a framer is another option but this can be expensive, inflating your sale price or reducing your margins. Now with the EasyWrappe™ system anyone can do a professional gallery wrap in-house in a matter of minutes. As the name suggests it really is very easy! Now you can offer the service to your customers - or do it for yourself - in minutes with no special skills required. All you have to do is follow the simple instructions in our video or PDF. You can create professional gallery wraps at a reasonable price with a same day service or even while your customers wait. It is all possible with the EasyWrappe™ stretching system. Please order an EasyWrappe Trial Kit below which are priced at our cost in order to encourage our customers to test out this incredible breakthrough product. With this, you will be able to create a 10"x14" professional gallery wrap with 29mm thick stretcher bars. 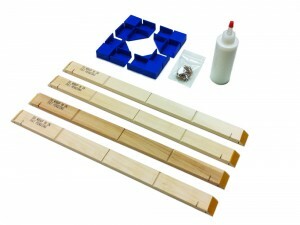 Each Kit comes with four reusable corner clamps, glue, extra pins, and a 10"x14" frame (Two 29mm bars of 10" length, and two 29mm bars of 14" length). There is absolutely no extra equipment required - all you need is this kit and your canvas print! After you own a trial kit, you will only need to purchase the bars you need (you will receive the cornerclamps in your trial kit, so be sure to keep them in a safe place!). If you need extra sets of corner clamps, please buy additional trial kits. Holding pins are included in each box of bars you purchase. 1.25" EasyWrappe Pro bars require a 1.5" border minimum per side (2" recommended) to account for what will be wrapping around the edges of the bars. - 16"x20" image size, which will be the main face of your finished canvas wrap. Please note: the cutter seen in the video is not included and can be purchased separately. Yes! They do. Included in each order are the same number of corner braces as EasyWrappe or EasyWrappe Pro bars. For an order of 20 bars, you would get 20 corner braces. Center braces are for Easywrappe Pro only. A 20" x 30" gallery wrap and larger should use a center brace. 20" center braces are the smallest size . If you are doing large panoramic gallery wraps, you may want to use additional center braces.